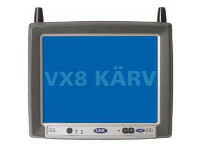 Cold Storage Capable: Optional touchscreen defroster extends application to cold storage operations. Smart Power Management: Optional integrated 9-36 VDC power converter and ignition control eliminates the maintenance expense and lost productivity caused by a dead vehicle battery. Vocollect TouchConnect: A simple touch is all that is needed to pair Vocollect SRX2 headsets to the CV31. Operate without Obstruction: A unique, compact design improves driver visibility by more than 20% compared to competing devices. The Perfect Upgrade: Compatible with Intermec CV30 mounts, scanners, keyboards and accessories—preserving legacy investments. 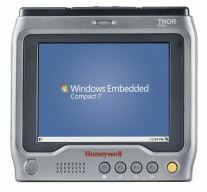 Powerful Components: Microsoft® Windows® Embedded Compact 7 operating system takes full advantage of the CV31’s OMAP4 1.5 GHz dual-core CPU and 1GB RAM. The Thor™ CV31 vehicle-mount terminal combines the latest high performance computing technology into a very compact form factor that minimizes driver line-of-sight obstruction. The CV31 presents your critical workflow information where it is easily seen, within reach, but never in the way. Optimized for vehicle installations, the CV31 features an internal 30-minute UPS backup battery and optional integrated DC-DC power converter that saves on the expense of installing external converters or charge protection devices. 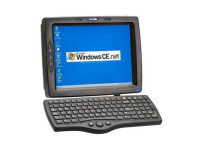 The UPS backup eliminates the frustrating wait to login and reconnect after swapping vehicle batteries, keeping operators productive. At shift end, there’s no longer a need to wait—idling the vehicle and wasting fuel—to logout and power-down the terminal; an optional ignition-control cable automates the process with a simple turn of the key. 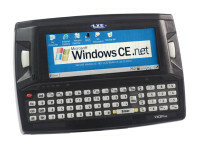 The CV31 is a true multi-modal device capable of handling complex voice-, screen- and scan-intensive applications. Ready for Vocollect™ voice-directed workflow systems, CV31 supports “hands-free, eyes-up” driving, so operators can stay focused. Embedded TouchConnect™ technology makes pairing a Vocollect wireless headset to the terminal quick and easy—just touch it and go. 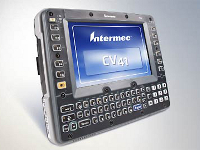 As the successor to the popular Intermec CV30, Thor CV31 shares the same physical dimensions, mounting attachment locations and I/O connector placement. The addition of a DC power adapter cable makes it possible to drop CV31 right into an existing CV30 vehicle installation, so customers can preserve their investment in mounts, accessories and scanners. Interchanging CV31 and CV30 spare pool units is a simple process, so equipment refresh plans can be phased in at a pace that’s right for each and every operation.